Lisa Hansen stepped among the steel girders, watching proudly as the building around her slowly took shape. Her family has been a leading force behind many of the facilities at the USC Health Sciences Campus, like the one she was walking through that day. But as a hardhat-wearing Hansen made her way through the dust and din, the hammering and drilling, she was not only proud, but also amazed — because everyone she met at the site was brimming with passion for their work. Thousands of people seeking treatment for cancer and other diseases will benefit from the seven-story, 116,000-square-foot Norris Healthcare Center. Now completed and being unveiled during a ceremony today, it offers surgery and outpatient clinical services focused on urology, infusion therapy, orthopedics and cancer care. It’s just the latest building to advance academic medicine at USC thanks to the Kenneth T. and Eileen L. Norris Foundation and its long history of philanthropic support that has dramatically shaped the university’s medical enterprise. One of the most stalwart supporters of the university, the Norris family has given more than $75 million to USC through its foundation and individual gifts. Much of that funding has been earmarked toward a singular goal: making cancer a disease of the past. That mantra has inspired decades of giving, leading to the construction of the USC Norris Comprehensive Cancer Center, USC Norris Cancer Hospital and the Harlyne J. Norris Cancer Research Tower. In the late 1960s, the National Cancer Institute sought out academic medical centers interested in creating regional cancer programs. The program inspired plans to build a cancer hospital and research institute at the Los Angeles County + USC Medical Center. Costs to create the new facility would be split among the county, NCI and USC. But in 1976, county leaders decided they couldn’t use general funds to support the project. A last-minute bond measure failed to pass, and the project seemed to have stalled. 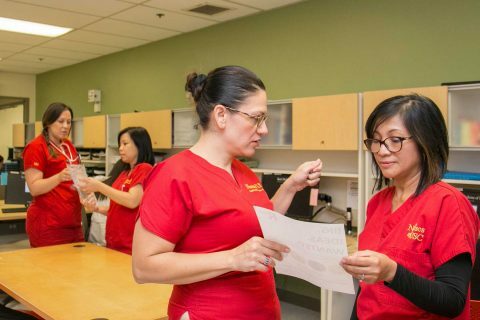 USC leaders quickly came up with a backup plan: building their own institute and hospital at the Health Sciences Campus. The NCI funded part of the $37 million cost, but USC had to raise the rest. 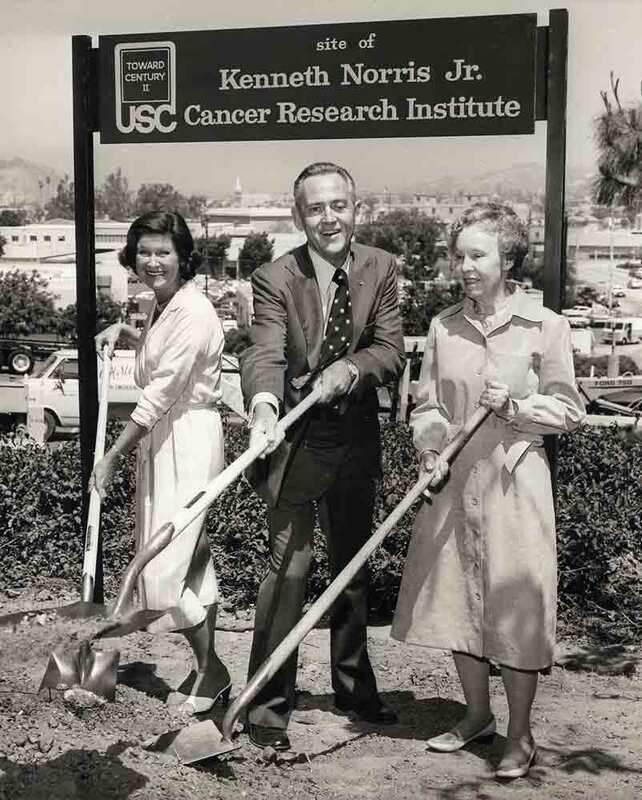 One of the first donors to step up was USC graduate Kenneth Norris Jr., whose father had helped raise money to create the Health Sciences Campus and provided gifts to establish the Norris Medical Library and Eileen L. Norris Cinema Theatre. The younger Norris contributed $500,000 on his own and talked the family foundation into donating $3.5 million, along with a subsequent $1 million challenge grant. Others followed his lead, and in May 1979, the university broke ground. It was one of the largest projects undertaken by USC — and one of its most difficult. Hansen recalls many lively conversations across the dinner table about challenges that threatened to derail the endeavor. 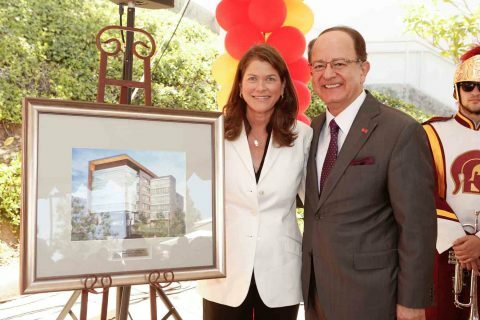 Four years later, Hansen stood alongside her mother and stepfather to unveil the new USC Norris Comprehensive Cancer Center and Hospital. Word quickly spread about the facility and its quality care for cancer patients. 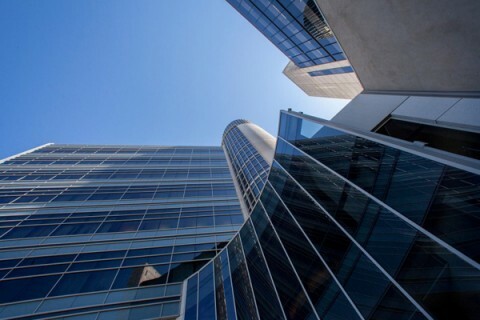 Many of those investments came in the form of lead gifts for new buildings to accommodate patients, doctors and researchers. Only five years after the center opened, it was already too small for the increasing demand. The first expansion drive started in 1987, when the Norris Foundation provided a $4.5 million gift to kick off fundraising. Nine years later, the Dr. Norman Topping Tower would open, providing 25 new labs and much more outpatient clinic and pathology lab space. Those facilities led to major breakthroughs, including recognition of the link between certain hormones and breast, ovary and prostate cancers. But as the research program grew, scientists again needed more lab space. And again, the Norris Foundation stepped in, providing $15 million to help build the Harlyne J. Norris Cancer Research Tower, which opened in 2007. The facility drew leading researchers and physicians to USC, and its integration of clinical and research space has served as a national model. 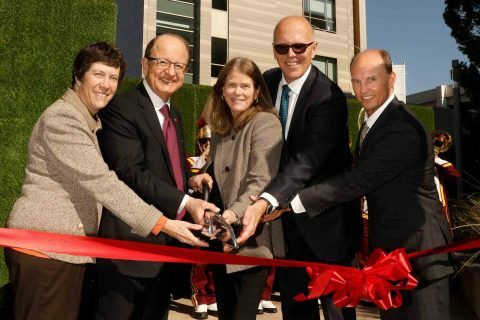 In 2011, while developing a long-term vision for the Health Sciences Campus, the USC Board of Trustees recognized that the university needed even more room to treat patients. USC leaders set an ambitious goal to double the space dedicated to patient care — to more than 2 million square feet — by 2035. The Norris family responded again, announcing a $15 million gift in 2012 to anchor the fundraising campaign for what would become the Norris Healthcare Center. The new building will enable USC to accommodate skyrocketing growth: In the last six years, the amount USC receives for treating patients has tripled, from $500 million to $1.6 billion. The new facility can handle 100,000 visits annually. It is home to the USC Institute of Urology, the USC Transplant Institute and a women’s specialty care and breast imaging center. It also houses clinics dedicated to radiation therapy, imaging and infusion therapy for cancers and other diseases. Beyond its modern technology and expansive operating rooms, Hansen said she is inspired by the medical center’s tranquil and welcoming atmosphere. USC is currently among the nation’s top institutions in cancer research, treatment and care. 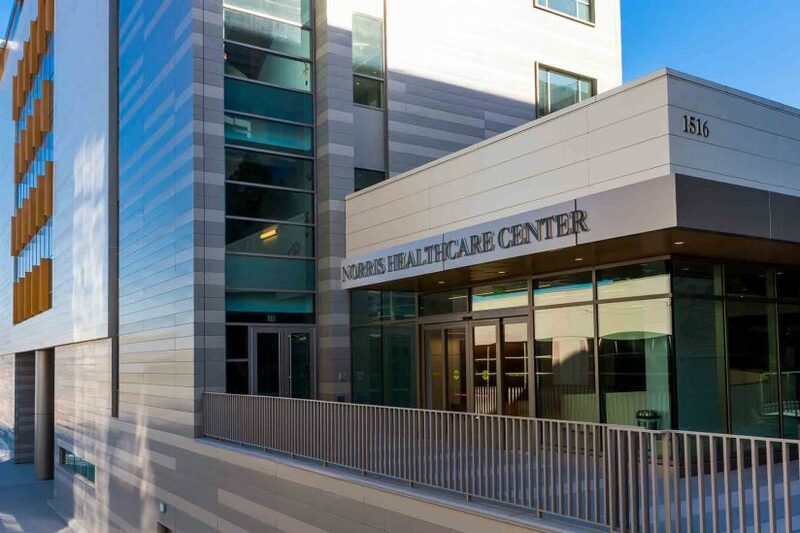 In 2015, the NCI awarded the USC Norris Comprehensive Cancer Center with an “outstanding” distinction, placing it in the upper echelon nationwide. We couldn’t have come this far in cancer care and research without the considerable support of many organizations and individuals. The foundation’s $15 million donation in 2012 to build the newest facility was augmented by additional philanthropic support raised as part of the $1.5 billion Keck Medicine Initiative of the Campaign for USC, an unprecedented fundraising effort to advance USC’s academic priorities and expand its positive impact on the community and world. When launched in 2011, the campaign had the largest fundraising goal ever announced in higher education — $6 billion. After exceeding its goal nearly 18 months ahead of schedule, the campaign continues to draw unparalleled support for the university’s mission and has been extended through 2021. Asked why the Norris family has continued to back USC for so many decades, Hansen was quick to answer: They’re both committed to the health and wellness of the people of Los Angeles and the many others who travel to receive their care from the Trojan Family. The hospital earns national accolade for excellence at an academic medical center. 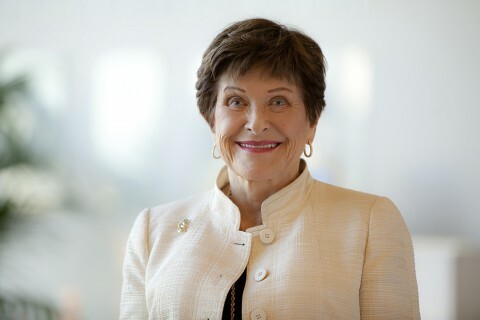 A longtime USC supporter, she built on her family’s legacy in health and the arts. The recognition reaffirms the center as a scientific leader as well as a vital community and regional resource, says Keck School of Medicine dean.